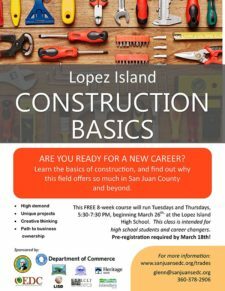 The San Juan County Economic Development Council (EDC) will offer free training in construction basics at Lopez Island High School this March, sponsored by the Washington State Governor’s Strategic Reserve Fund, the Washington State Department of Commerce, and by the Lopez Community Land Trust. The course will be taught by Paul Henriksen, and will cover basic construction skills and career paths in the trade. The curriculum includes lectures, safety/tool use demonstrations, and a hands-on building project. All materials and tools will be provided. This program is intended for young people and career-changers considering a career in the trades. The course will benefit participating students as well as local construction companies in need of skilled employees. 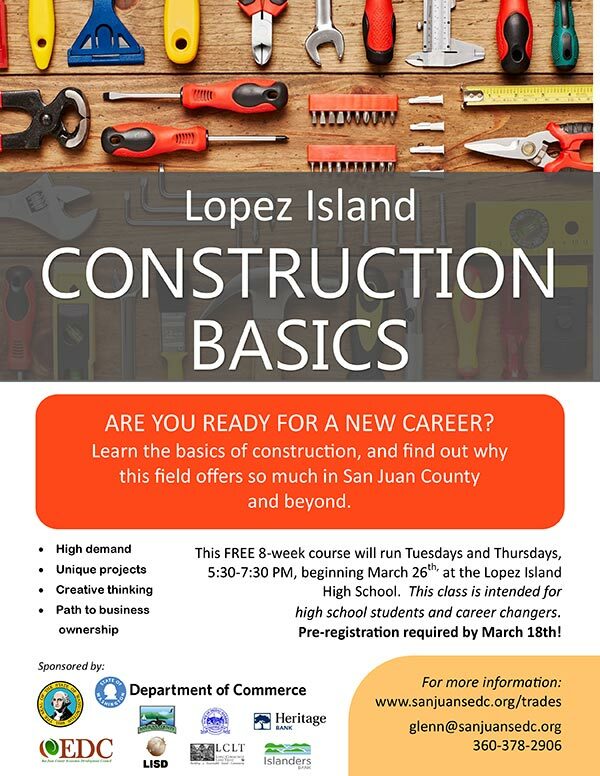 This class is free to residents of San Juan County, but space is limited and requires pre-registration as well as a filing fee of $10. This 8-week course will run from 5:30-7:30PM Tuesdays and Thursdays from March 26th through May 16th of 2019. The deadline to apply is Tuesday, March 19th. The EDC’s Trades Education Initiative is additionally supported by San Juan County, the Town of Friday Harbor, the Port of Friday Harbor, San Juan Island School District, Heritage Bank, and Islanders Bank.